Add that extra zing to the coming Raksha Bandhan and make it for unique for your beloved with this sweet petite Gift Hamper. 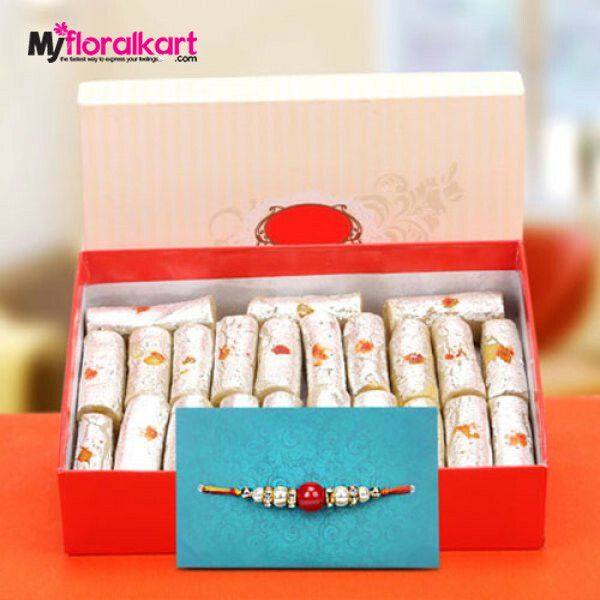 It includes a box packed with haldiram’ssumptuousKaju Roll and an astoundingRakhi. They will be couriered to you within a single week from the date they were ordered. -- Please Select --09:00 A.M.-1:00 P.M. 01:00 P.M.-5:00 P.M. 05:00 P.M.-9:00 P.M. 10:00 A.M.-11:00 A.M. 11:00 A.M.-12:00 P.M. 12:00 P.M.-01:00 P.M. 01:00 P.M.-02:00 P.M. 02:00 P.M.-03:00 P.M. 03:00 P.M.-04:00 P.M. 04:00 P.M.-05:00 P.M. 05:00 P.M.-06:00 P.M. 06:00 P.M.-07:00 P.M. 07:00 P.M.-08:00 P.M. 08:00 P.M.-09:00 P.M. 09:00 P.M.-10:00 P.M. 23:30 P.M-12:30 A.M.